David Ceperley worked as a staff scientist at both Lawrence Berkeley and Lawrence Livermore National Laboratories. In 1987, he joined the University of Illinois at Urbana-Champaign's Department of Physics. He researches quantum Monte Carlo methods and quantum many-body systems. December 26, 1949Birth, Charleston (W. Va.). 1971Obtained BS in Physics, University of Michigan, Ann Arbor (Mich.). 1976Obtained PhD in Physics, Cornell University, Ithaca (N.Y.). 1976 – 1977Postdoctoral Fellow, Laboratory of Theoretical Physics (Laboratoire Gravitation et cosmologie relativistes). 1977 – 1978Postdoctoral Fellow, Rutgers University. 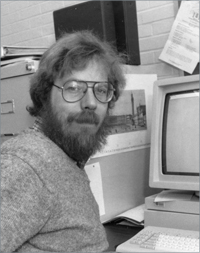 1978 – 1981Staff Scientist, National Resource for Computation in Chemistry, Lawrence Berkeley National Laboratory. 1981 – 1987Staff Scientist, Lawrence Livermore National Laboratory, Livermore (Calif.). 1985 – 1986Visiting Professor, University of Trent (Università degli studi di Trento). 1987 – presentResearch Scientist, National Center for Supercomputing Applications (1987-present), and Associate Director of Applications, National Center for Supercomputing Applications (1997-1998), University of Illinois, Urbana-Champaign, Champaign (Ill.). 1987 – presentAssociate Professor of Physics (1987-1991) and Professor of Physics (1991-present), University of Illinois, Urbana-Champaign, Champaign (Ill.). 1991 – 1994Member, Advisory Board, Institute for Theoretical Physics, University of California, Santa Barbara. 1998Awarded Aneesur Rahman Prize for Computational Physics, American Physical Society. 2002 – 2003Visiting Professor, École Normale Supérieure de Lyon. 2006 Member, National Academy of Sciences. Both employed at Rutgers University. Both employed at Lawrence Livermore Laboratory and Lawrence Livermore National Laboratory. Both employed at Lawrence Berkeley Laboratory. Both employed at Lawrence Livermore National Laboratory. Staff Scientist, National Resource for Computation in Chemistry. Research Scientist and Associate Director of Applications. Associate Professor of Physics and Professor of Physics. Fellow and received 1998 Aneesur Rahman Prize for Computational Physics. Obtained PhD (Physics) in 1976. Obtained BS (Physics) in 1971.